Are The Oldest Yorkshiremen 10,000 Years Old? On the road from Scarborough to Malton is Seamer, at the easterly end of the Vale of Pickering. It is here that pollen analysis and radio carbon dating have identified a site occupied circa 7,500 B.C. by Early Mesolithic Yorkshiremen. The location is Star Carr immediately after the bridge over the River Hertford on what was the edge of prehistoric Lake Flixton . Starr Carr Mesolithic Settlement Site south of Seamer North Yorkshire. The Mesolithic period was sandwiched between the old and new Stone Ages. Some archaeologists estimate that Star Carr was founded in about 8770 BC and was occupied for at least 300 years. The Mesolithic period saw the introduction of stone tools, agriculture and domesticated animals. Waterlogged soil in the area contains peat which has helped to preserve many objects found at Star Carr. Evidence of several homes and a large wooden platform have been found at Star Carr. The inhabitants probably used turf, thatch or bark for the walls, and covered the floors in plants, moss or reeds. The Star Carr site is a Scheduled Monument of archaeological importance. The Oldest Yorkshiremen were dated to the Mesolithic era by pollen and radio carbon dating. 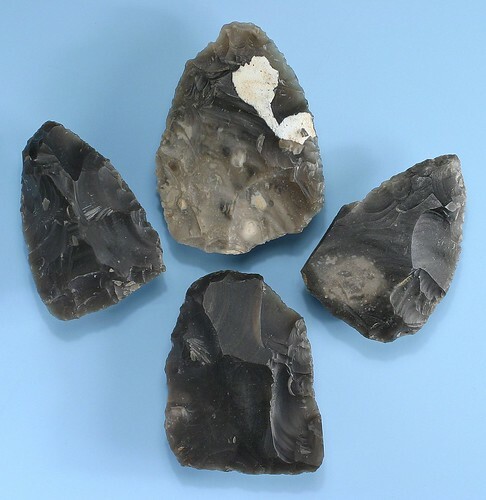 The Starr Carr site was discovered in 1947 by a local archaeologist John Moore who found the first flint blade sticking out from a dyke. The site was excavated from 1949-1951 by Cambridge University and has been re-excavated several times since. ‘Grahame Clark’s excavations at Star Carr from 1949 to 1951 have long been regarded as a model of how archaeological investigation should be conducted. In addition to this, the importance of the site itself has established for this report on the excavations a permanent place in all archaeological libraries’. About 17,000 worked flints and 300 cutting tools called burins were found when the site was excavated. Some of the finds were housed at the Scarborough Museum. Other finds have been donated to the British museum and the University Museum of Archaeology and Ethnology at Cambridge. Modern Flints! Flint knives found in a group of tools and waste flakes in an Early Bronze Age grave circa 2000 B.C. There is little to see other than featureless farmland as the site was buried 9 feet deep, about a foot for every thousand years! It is still worth visiting to picture the activities of our ancestors. The seasonally occupied homes at Star Carr were used by families of hunter fisher folk. It was a period of mildish winters and the bones of many animals included deer, ox, elk, hare, pine martins and beaver were excavated. The hard working folk created many tools in addition to the numerous flints. They used antlers to make spear like weapons, bark for net floats, a birch wood paddle for fishing and iron pyrites flints to strike a light. About 9,000 years ago industrious Yorkshiremen were leading the way and we are fortunate that the discoveries and pollen dating can help us understand so much about our predecessors.